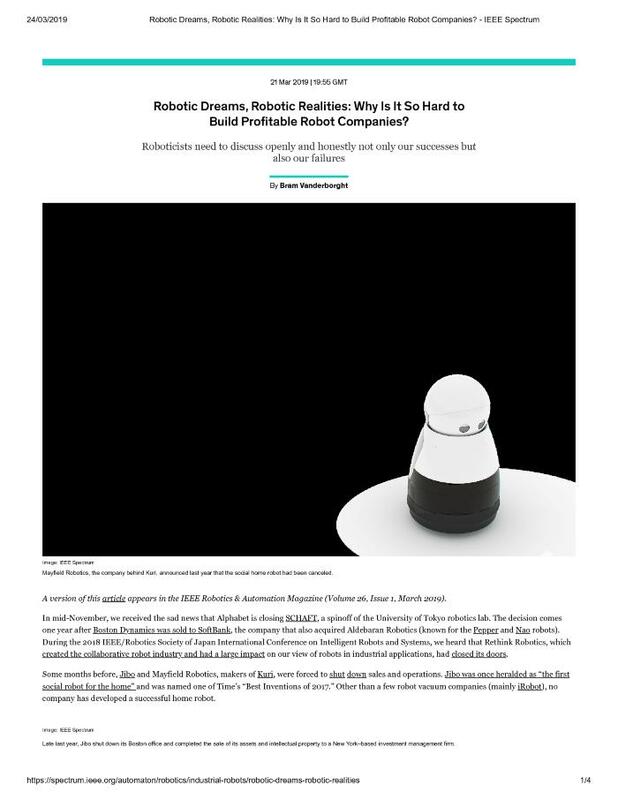 Decimal Lab : Text : Robotic Dreams, Robotic Realities: Why Is It So Hard to Build Profitable Robot Companies? In mid-November, we received the sad news that Alphabet is closing SCHAFT, a spinoff of the University of Tokyo robotics lab. The decision comes one year after Boston Dynamics was sold to SoftBank, the company that also acquired Aldebaran Robotics (known for the Pepper and Nao robots). During the 2018 IEEE/Robotics Society of Japan International Conference on Intelligent Robots and Systems, we heard that Rethink Robotics, which created the collaborative robot industry and had a large impact on our view of robots in industrial applications, had closed its doors. Some months before, Jibo and Mayfield Robotics, makers of Kuri, were forced to shut down sales and operations. Jibo was once heralded as “the first social robot for the home” and was named one of Time’s “Best Inventions of 2017.” Other than a few robot vacuum companies (mainly iRobot), no company has developed a successful home robot. Boston Dynamics: Hey Buddy, Can You Give Me a Hand? Humanoid Robot Sophia - Almost Human Or PR Stunt?